EA, it's rare that you listen to the community in regards to fixing your game and when you do you're listening to the wrong people. First few games, either due to lag or just needing a slight adjustment to my game, I wasn't overly impressed. But after those first few games, it felt much better. The "skill gap" now makes more sense. The below average forwards are struggling a bit, just as they should. There is a reason they are below average and the game should reflect that. All they need to do is step up their game. This is like a cruel joke by a jaded Producer. The game is good. Get better at it. I was against the rollback, I was wrong, game is solid. I agree the current tuner has created a real skill gap, people have different play styles with varying success. Home run. Somebody is having trouble scoring. This is the most fun I've had with an nhl game in a while. I actually had to force myself off last night. Kudos to EA for letting the community help push the game in a better direction. Plus the introduction of servers is another step in the right direction. Very happy with the communication and feedback this year. Thanks @NHLDev and team for being progressive on getting the game to a better place. Thanks Ben ( @NHLDev ) and to everyone on the team. Make sure you tell the team we appreciate the efforts and listening to us! I agree, the game has become more about getting beat, holding your right stick up to get the checking animations and chasing a guy around the ice. If you try to create space or separation do not bother, they can stick their stick through your legs and get the puck. I agree, the game has become more about getting beat, holding your right stick up to get the checking animations and chasing a guy around the ice. If you try to create space or separation do not bother, they can stick their stick through your legs and get the puck. @NHLDEV sorry but you have created the worst hockey game ever. Sorry, but you must of skipped 15 thru 18 if you really feel this is the worst hockey game ever. Go pop 18 in and tell me that was in a better state then this. Are you saying you can't beat a defenseman who only just follows you while holding the right stick? If that’s the case doesn’t much matter what tuner is currently being used really. I know “git gud” is overused but it applies to that dude if he can’t avoid a guy running around like a chicken with its head cut off and his arms in the air. I see carriers creating separation all the time. They just don't do it using the same plays the last 6 years. I think the game is in a really good shape right now, which makes me curious why you think it's so bad. By moving HUT to servers, all my problems with lag is gone. The only downside is that Vs is no longer an option for me, now that I actually can see how bad the lag was/is. I have a clip I wanna show you that I originally recorded because I felt I was being stonewalled by the goalie. But it also goes to show how well the current tuner works. You can create plays by moving the puck and if you don't move it, chances are you'll turn it over. Personally, I think it would be even better if plays like my opponent pulls off @1:20 -1:23 didn't make it through. In that little segment it feels like first the puck and then the player moves right through me. Before the tuner it felt like that all the time, now it all makes a lot more sense to me. As I said, I am genuinely curious as to what you think is worse than before? Maybe you could post some clips, showing what you mean? I am one of the few people that hate the loose puck bouncy puck physics, high collisions, and bumps. This game forces people to play the trap, shoot shots from bad angles to trigger animations, it allows for no individual skill in deking and is boring to me. All I wait for is what animation is going to trigger when I try to deke to fast, or pass to fast, or think to fast. Every year the game plays like a peewee hockey game, which might be fun for some people, not me. This game is tailored towards chaos in front of the net. 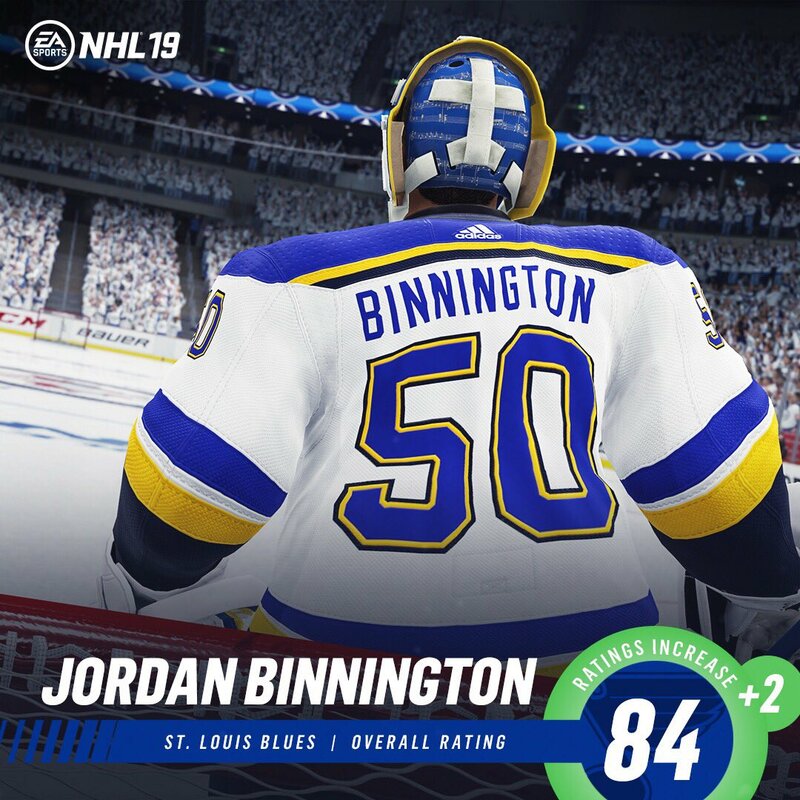 Holding on to the puck allowed for creativity, but EA listened to a few people on this forum. I am one of the few people that does not like the new change. I still win my games and sometimes lose, so if this is the direction people want, I am done after this year. From the breakout to the incursion right up to the goal, I never let my opponent come closer than 2 feet from me before passing off the puck to an open man. And usually I would make 2-3 passes on the breakout instead of carrying, but my opponent was so clearly falling back, I could take advantage of it and enter the zone easily. I also goaded him into going down to block the shot/pass early on making it easy to figure out what my plan of attack should be. If you know your opponent is going to be attacking the puck handler all the time, pass it out. If he's just going to stay in the middle, cycle the play around and force him to move. If he doesn't eventually the AI will and you take advantage of it. Shooting in hockey is not always about scoring. It's about trying to force the defense and the goalie to move, create chaos so you can take advantage of it. Move the puck, move the play. Don't just carry it and expect to go around/through 5 players on the ice. Passing the puck up the ice is much faster than skating it up anyways. I also goaded him into going down to block the shot/pass early on making it easy to figure out what my plan of attack should be. That was a nice play by AI Ryan to backskate our in front of the net, making himself available for the pass. 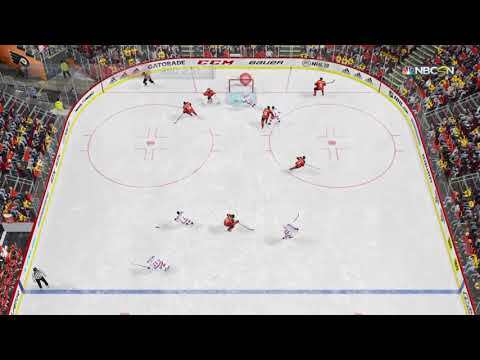 Have not seen that once in HUT. What offensive strategy were you using?